In July 2010 Steve Munisteri was elected Chairman of the Republican Party of Texas. Steve’s victory was the first time in recent history that a challenger, backed by a grassroots groundswell of support, had defeated a sitting chairman. YCT’s Historian, Kasey Golden, recently sat down with Mr. Munisteri to talk about YCT and how his experiences with the group help him in his new job. How was Young Conservatives of Texas founded? 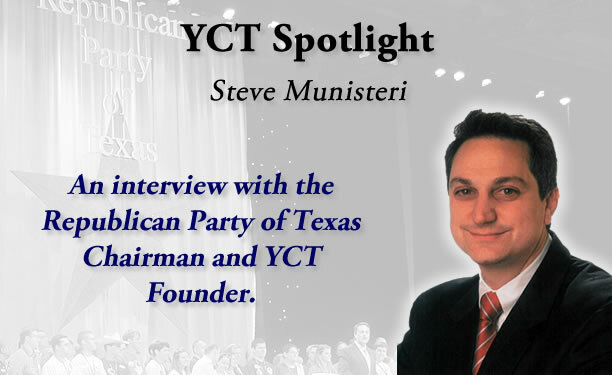 Before founding YCT, Steve Munisteri was the State Chairman of the Texas chapter of Young Americans for Freedom (YAF). After the YAF state convention in February 1980, Steve decided to sit down with board members to propose a new state-based organization. Munisteri and other Texas YAF members did not like how the national organization was run. It was run in a top-down fashion, neglecting state politics and failing to work with and through the grassroots. Indeed, after state chapters had spent much of their time raising money for YAF, they did not feel like they were getting a return back to their state chapters. Steve proposed a new organization; one that would have more effect on state and local politics and that would enable students to get real, hands-on experience with Texas politics. Recognizing Steve’s vision, the board voted unanimously to create Young Conservatives of Texas. The new organization was founded and unveiled to the public on Texas Independence Day, March 2nd, 1980. How did YCT make you who you are today? Mr. Munisteri emphasizes that, most importantly, YCT gave him the confidence to accomplish some of his greatest goals. After successfully establishing a new organization, he felt that he could do anything. In addition, his leadership of YCT also helped him to develop skills that have served him throughout his career. YCT taught him to become a great public speaker, which served him well in his law profession. He was forced to learn how to work with people who have varying political views and shepherd them towards a common goal. And, after spending some time managing YCT’s money, he soon mastered the basic skills required to make a budget, pay bills, and run a statewide office. What impact do you see YCT making in Texas politics today? “YCTers have become an integral part of campaigns because we have so much enthusiasm. We have become a big help across the nation. The perfect example of the power of YCT to win a campaign is how YCTers helped me get elected as RPT chairman,” Mr. Munisteri argues. He also points out how important the Young Conservatives of Texas endorsement is to a candidate’s success. When he was running for Chairman of the Republican Party of Texas, Steve said he made sure that YCT’s endorsement was prominently listed on all of his campaign materials. Steve knew that because of our consistent, principled endorsement process, that YCT’s endorsement carried a lot of weight amongst conservative voters. How do you think being in YCT will help students in their futures? Along with the leadership and practical political experience members receive, Steve stresses the vast network of YCT alumni that has formed over the past thirty years. Indeed, YCT can claim at least eight alumni who are currently elected to state or federal office; six State Representatives, a Congressman, and a Senator. Along with these elected officials, YCT alumni work in various positions across Texas—business, law, politics, lobbying, and more—and many feel it is their duty to hire a fellow YCTer when they get the chance. Congressmen and State Representatives always look for YCTers and prefer to hire a YCTer over other candidates. What do you think Texas will accomplish in the 82nd Legislative Session? Mr. Munisteri believes that a strong Voter Identification bill will be passed and that, despite the state’s deficit, the budget will be balanced without raising taxes. He is also hopeful that there will be some effective changes made to secure our border and deal with illegal immigration. And because of the number of conservatives in the Texas House, he is not especially worried about redistricting. As for YCT’s top legislative priority for the 82nd Session, Steve is a little more skeptical. While he is confident that a concealed carry on campus bill will pass the House, he predicts that it will be held-up and defeated in the Senate. Overall though, it is clear that YCT and YCTers will play an integral role in shaping policy during the 82nd Legislative Session. Since being elected RPT Chairman, Mr. Munisteri has seen tremendous success. He fulfilled his campaign promise to eliminate the party’s record debt, bringing the party into the black ahead of schedule. Afterward, he led an effort to create a “rainy day fund” for the state party to ensure its financial solvency for years to come. Steve also oversaw great success by the RPT in the 2010 elections; 22 Republican challengers defeated incumbent House Democrats. In addition, after the election, Steve has seen two additional Democratic State Representatives abandon the Democratic Party to become Republicans, ushering in a 101-49 Republican supermajority in the Texas House. YCT is very proud of the job that he is doing and we are proud to call him one of our own. © Copyright 1980 - 2019 Young Conservatives of Texas. All rights reserved.